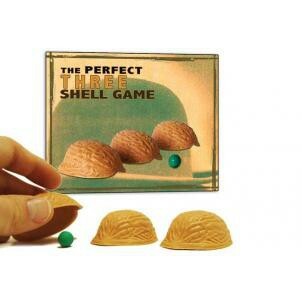 We offer the Perfect 3 Shell Game with a pea that is nothing short of perfection! Made of elastomeric resin, they’re a bit more rubbery then regular plastic which makes shells easier to grip. Molded from real walnuts. Designed to glide, rock, and grip perfectly. Tacky peas won’t roll away! Comes with complete instructions on the game.